It’s not every day that you’re asked to create Stonehenge out of toasters! But that was our challenge for this press advert for Magimix. We had to art direct the photoshoot and work closely with Charlie Ross of Monitoba Photography to create a set of shots that we could comp together into the final image. The task was made more difficult because the toasters were made of stainless steel which is not only hard to photograph, but needs a lot of retouching afterwards to get rid of unwanted fingerprints and blemishes. 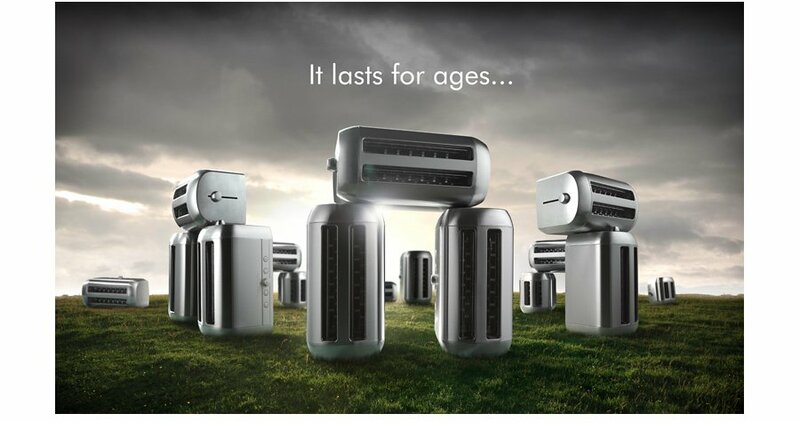 Each toaster needed to be carefully retouched, cut out and then composed onto a dramatic landscape. The landscape itself was made up of several shots, a mix of moody seascape skies and grass. The final image was a monumental success! The final result – after each toaster was cut out, cleaned up and placed onto our new background. Each Toaster was photographed separately or in small groups and then carefully composed into one complete image.